Can you guess the book by the description? Still looking for a Valentines Day display? 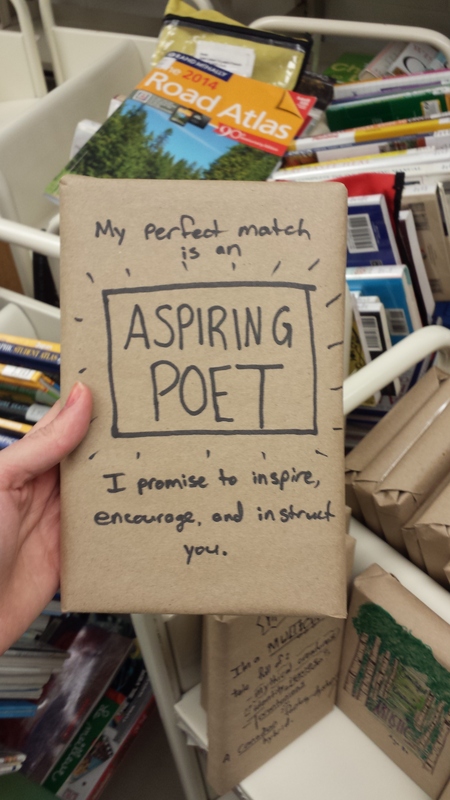 It’s not too late to put together a Blind Date With a Book display! I’ve seen variations of this display, and absolutely love the effect. A patron looking at a wall full of appeal factors has a more interesting decision to make than a patron looking at a wall of book covers. They might learn something about themselves; they have to ask themselves what makes me like the books that I like? I decide to write the descriptions sort of like dating ads, and to include as many details as possible. The biggest risk here is that a patron will chose a book that they have no interest in reading. My goal was to make that very unlikely by writing careful descriptions. I put a lot of effort into selecting a diverse group of books and deciding which appeal factors to write on the covers. I chose books from adult fiction, adult non-fiction, YA fiction, children’s chapter books, and children’s picture books. I tried to include at least one hint towards subject matter and one towards tone. Sometimes I included the genre in the description, but sometimes I didn’t. I wanted to encourage readers to step outside their book comfort zone – if the tone and subject matter intrigued them, maybe it won’t matter that it was a fantasy instead of a cozy mystery. I used brown kraft paper to wrap each book, and a simple black sharpie to design the teen and adult covers. I was able to delegate the design of the children’s covers to an artist coworker who did an amazingly colourful job. I created a flyer encouraging patrons to expand their reading repertoire by going on a blind date with one of our books. Signage is very important with this type of display – you don’t want a bunch of mysterious unexplained packages sitting around in a public library. Since my library uses RFID tags to check books in and out, I didn’t need to do anything special to allow for smooth circulation – our scan pads can easily read through the paper cover. Libraries who use barcodes to check books in and out could write the barcode number on the back of the paper, or attempt to cut out a hole for the barcode itself. My biggest challenge was choosing viable books. While it was tempting to include new and popular books, I obviously had to chose books that didn’t have a holds list. Depending on the length of your display you might want to change the “Status” of each book to “On Display” so it’s not mistaken for missing. When I was ready to wrap the books I found that 8 of them had been checked out since I prepared my sheets. I’ve put holds on the items and as they roll in I wrap them (and fill gaps in the display). I can see that a challenge for a lot of librarians might be time. 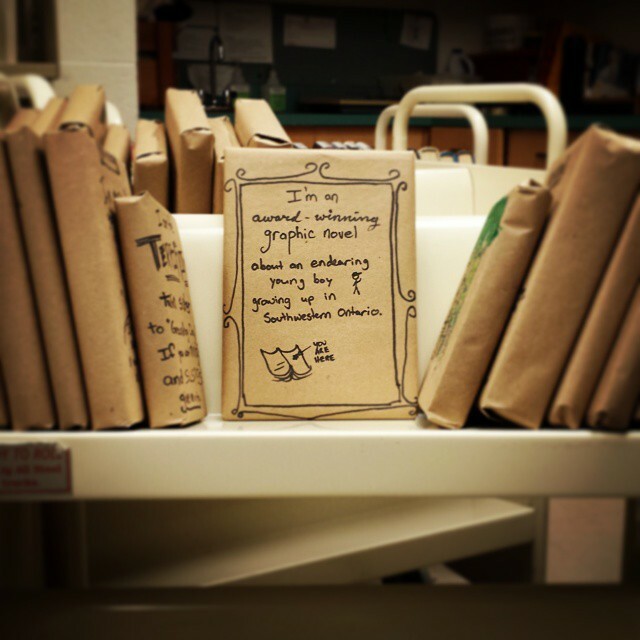 Choosing diverse books, coming up with unique descriptions, writing them out, and wrapping them – that’s a lot of work for one display, even if it is a special one. Some solutions might be writing a quote from a professional review on the cover, choosing 3 adjectives to describe the book, or even just writing out the first sentence of the book. Some of the design and wrapping work can be delegated to volunteers or student pages looking for a special project after their tasks are completed. I have also made my list of descriptions available for download. As of now, my only method of evaluation is listening to people talk about the display, and keeping track of how many books have left the shelf. After 1.5 days 6 books had been taken – a perfectly even distribution of children’s, adult, and teen. Since the display hasn’t been marketed at all or shared on our social media, I’d say that’s a pretty good start. And people who wander past seem enthusiastic and curious about it (which is basically my goal with every display). I’m still debating adding a “What did you think?” form to the rest of the books – just a simple form with a spot for title, author, and comments about the book. Maybe an open-ended question about their experience with the Blind Date aspect. I think it’ll be a good way to a) measure how effective the display was b) discover ways of making if better c) learn about the reading habits and tastes of the community and most importantly d) make it an interactive, social experience for the readers. Readers always want to share their opinions – be they good or bad – and I love to hear them. It’s a sort of “professional development” experience for a librarian to really listen to the opinions of readers. I think most libraries could provide more opportunity for that. Update: I’ve created a second post about Blind Date With a Book (now that I’m 1 year older and 1 year wiser). Check it out here. What do you think? 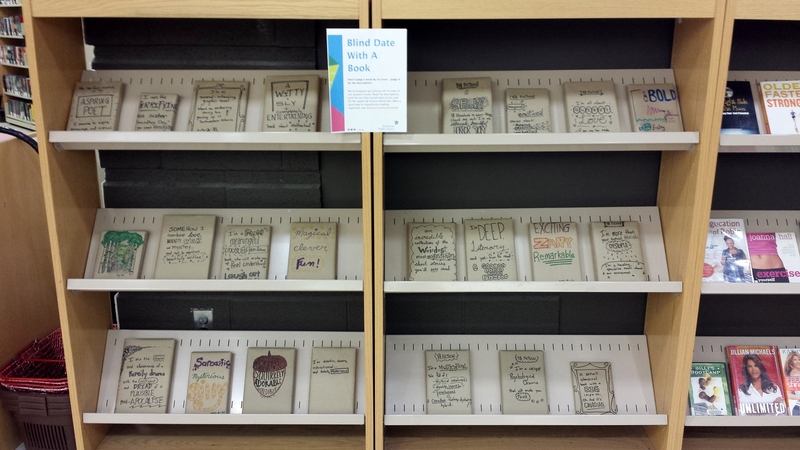 Have you seen a blind date with a book display that was done differently? This is a brilliant idea! I like it and will try this out in our Lower School library here in the Philippines. I did this last year, am just looking for ideas for 2018. Thanks for all the tips! One thing I did was we used red and white paper to wrap them, just to make it more colorful and the writing was done on the computer with a co-ordinating color. Thank you so much for sharing all this terrific information. I am going to do one now – something like “It’s Spring and love is in the air.” I really appreciate your time and generosity in sharing. Next Post What I Loved This Month #8: Personality Theory, Die Cutter, Donuts, and Dance Parties!